Normally we care about weather now, or even more often weather in the future, but it can happen that we want to know what took place sometime in the past. You might, for example, want to review past weather data for the analysis of a voyage or yacht race, or maybe to look into sea and wind conditions from an event you see in the news. Schools like ourselves are often looking though archives for an example of a point we want to illustrate.... and indeed the example given below will answer one of our quiz questions, namely what was the wind speed and direction and the pressure at 30N, 130W on July 4, 2001? Before addressing this specific question, I note that we are looking for archived data at random places, which often means we need to find the corresponding surface analysis maps. But if you happen to just need the data from a place that has an official reporting station, then the process is much easier. 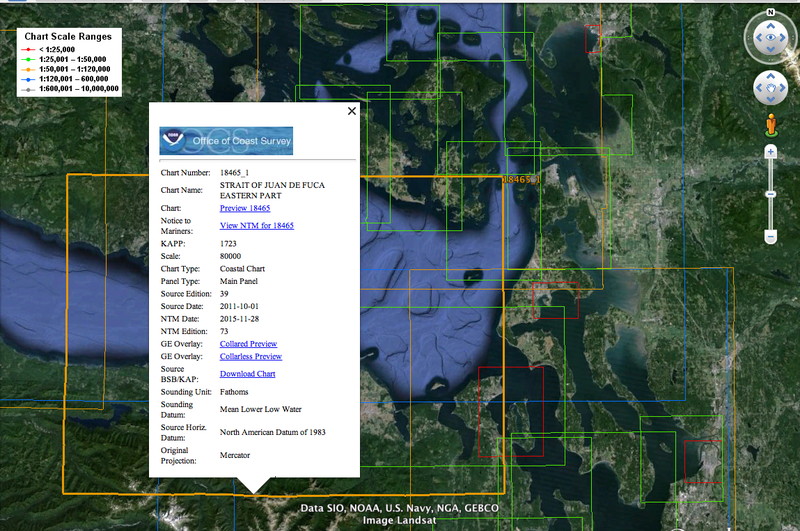 Just find the station at the National Buoy Data Center and then at the bottom of the page find the link that goes to archived data. Here is an example from our local West Point Lighthouse, station WPOW1: Historical Data & Climatic Summaries. In any event, it is almost certain that had we known the new right place to look for what we want, it would take much longer to succeed. In fact, we progress with our search below using the old name of the agency (NCDC), though it looks like Google does indeed know what NCEI stands for. We will have to change our training materials to cover the new name. Below is one path to the map we want for the Pacific surface analysis at 30N, 130W on July 4, 2001. 3) Click I want quick access to your products. 4) Choose No. 9, scrolls you down to charts section. 10) You will see a list of the 4 maps of that day. Click the .sfc.12 product (that will be the 12z map). 11) Right click and save the map, so you can view it better. They will be in the wrong orientation. 12) Then open it in a viewer of choice, rotate it, and look to 30N, 130W to find the answer. That is the process and it will show you all the options you have for archived data as you play around with the site. The video below illustrates the above, and then address the issue that once the map is in hand it might not give you what you want without further analysis, so we include that analysis as well in a second short video. The video below shows how to read the data we want from the map, once we have found it. We have been working on using Google Earth (GE) for practice with echart navigation, which led to a couple short videos on the process listed at the end here. In this process we discovered a remarkable NOAA service that I am embarrassed to say that I did not know about till now. I am not sure how long it has been online, but it is there now and works great. It is part of their new products on seamless display, that we discuss more at the end here. The GE feature of that program is the subject at hand. With this easy to use utility you can see at a glance all 2100 NOAA charts outlined on the GE world map, with the ability to actually view the individual charts, with or without a border, as well as a very quick way to download the RNC echart of any one of them. The process is explained on a page of the NOAA site called Seamless Raster Navigational Chart Server & Web Map Services, but you pretty much have to know it is there to find it. 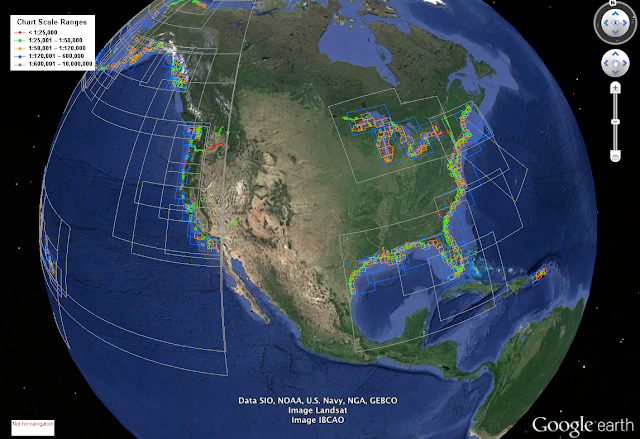 Once there the main link that is needed is the Google Earth kmz file, called NOAA_RNCs.kmz. When you click that link it will download the 340-kb kmz file to your downloads, and then just open Google Earth and drag and drop that file onto the GE world. You will see something like Figure 1. Figure 1. NOAA's GE interactive chart catalog. Then just zoom to the region you care about. Below is the region we use for our coastal nav training program near the chart 18465. In Figure 2 I have rolled the cursor over the 18465 boundary, which highlight it, then clicked the boundary line to pop up the control panel shown. Figure 2. Zoom into a specific chart. At this point you can start experimenting with the options. The "collarless preview" loads the chart without the borders; the collared preview shows a full copy of the paper chart with all borders and scales. Below is a short video about this process, showing some of the neat features it offers, including how to do a a direct download of any RNC echart. We also have an earlier video that shows a bit more of using the GE display for practice with echarts, though for work on 18465 it would be best to use the above, latest chart rather than the 18465TR we discuss in this older video. As noted earlier, NOAA is getting started with their own version of this type of display from their own server, which has a lot of potential, but it is not yet nearly as convenient as the GE version. Especially promising is the counter part they have for vector charts, but this one is even less developed than their seamless raster chart. All in all though, NOAA has been doing a tremendous amount of development of their site with many benefits to mariners. 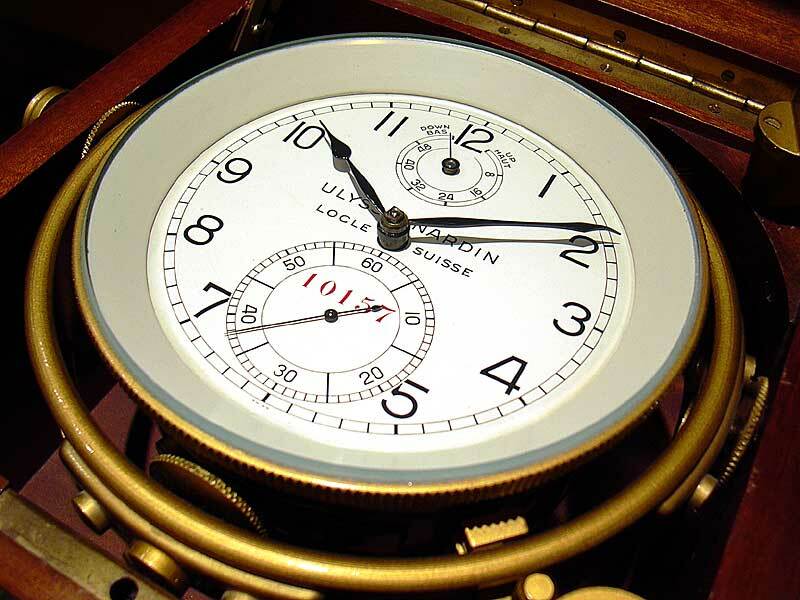 We have often had occasion to point out how the USCG supports navigation schools, but one of the contenders for the top price is their use of chronometer time (CT). Someone making up the tests must have read the fine print of the Bowditch definition and had an aha moment on how they could support navigation schools. In other words, CT is the same as UTC, except for a possible chronometer error (CE) correction, but it can be kept on a 12-hr watch dial. The insidious step in the USCG exam preparation was to use this concept of CT on a 12-hr dial, and then not tell the test taker if the chronometer time is AM or PM! That way, every single USCG cel nav exam question must start out with the candidate having to figure out what time they meant using other information in the question—it brings to mind the old computer game called Myst. Granted, candidates do need broader cel nav knowledge to figure out the time, but it runs the risk of implying this is, in some universe, a viable way to keep time, which of course it is not. No navigator in the world would use such a system. So the first step of each USCG cel nav question is to, for example, read the given time of the event as CT = 10h 13m 20s and then use other information in the question to determine if this is 10h 13m 20s UTC (CT was AM) or is it 22h 13m 20s UTC (CT was PM). Sometimes the process is straightforward, in that we get at least one zone time (ZT) and a DR-lon. We can figure the zone description (ZD) and from this convert the ZT given to UTC. UTC = ZT + ZD. Below are a few examples of how candidates must figure out the time. On 15 August your 0512 zone time position was LAT 29°18.0’N, LON57/G 57°24.0’W. Your vessel was steaming on course 262°T at a speed of 20.0 knots. An observation of the Sun’s lower limb was made at 0824 ZT. The chronometer read 00h 22m 24s and was slow 01m 34s. Find ZD: 57/15 = 3.8, so ZD = +4. Then UTC = 0824 + 04 = 1224, so CT must be PM, and we get the right UTC = 12h 22m 24s + 01m 34s = 12h 23m 57s. 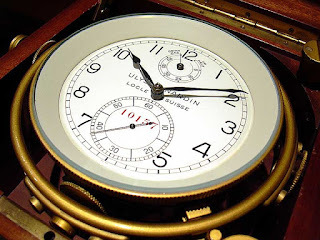 The chronometer error correction (CE) is normal. If slow you add it; if fast you subtract it. On 10 March in DR position LAT 21°42.0’S, LONG 57°28.0’E, you take an ex-meridian observation of the Sun’s lower limb. The chronometer time of the sight is 08h 28m 17s, and the chronometer error is 00m 00s. No zone time given, and it does not say upper or lower transit, but it has to be upper for the sun viewed from 21S. We also know it must be near midday on ZT. Find ZD = 57/15 = 3.8, so ZD = -4 and use UTC = ZT + ZD to find ZT = 0828 - (-4) = 1228. Or it could be ZT = 2028 -(-4) = 2408, which is near local midnight, so this can’t be right. The first is correct and UTC = 08h 28m 17s (CE = 0). On 24 August in DR position LAT 26°49.4’N, LONG 146°19.4’E, you observe an amplitude of the Sun. The Sun’s center is on the celestial horizon and bears 084°psc. The chronometer reads 07h 55m 06s and is 01m 11s fast. Variation in the area is 15°W. What is the deviation of the magnetic compass? This is an amplitude problem, so we know the sun is rising or setting. With bearing given as about 069T (084-15), it must be rising, so we know local time (ZT) is early morning. The ZD = 146/15 = 9.7 or ZD = -10. So we have two choices for the local ZT, which in turn tells us if the CT is AM or PM. If CT is AM, then ZT = 0755 + 10 = 1755 ZT, or if PM we have ZT = 1955 +10 = 0555 ZT the previous day. That is, going back to the definition of ZD, we have UTC = ZT + ZD = 0555 ZT (Aug 24) + (-10h) = 1955 Aug 23. Without looking up the sunrise times, we know this must be 0555 ZT (ie CT was PM) and therefore the right UTC of the sight is 19h 55m 06s -(01m 11s) = 19h 53m 55s on Aug 23. The other point we are reminded of is the wrong answers in USCG exams are not random. It is probably not fair to call the problems “trick questions,” but there are certainly trick answers. Namely, the wrong answers for most USCG exam questions are the result you would get from making a typical error. We see this here by noting the wrong date leads to one of the wrong answers, but the distracting answers in most amplitude questions are more subtle. The wrong answers are mostly tied to making an error in the conventional amplitude solution (using Bowditch tables 22 and 23), which is the intended way to solve the problem. I have more to say about these amplitude questions elsewhere, but it is beyond the subject of figuring out what CT means. On 16 June in DR position LAT 50°57.0’S, LONG 53°03.9’W (ZD+4), you take an ex-meridian observation of Acrux at lower transit. The chronometer time of the sight is 10h 08m 18s, and the chronometer error is 02m 12s fast. Again, the ZT of the sight was not given, but with ZD = +4h we can check CT. That is, CT = 1008, means either UTC = 1008 or 2208. The first gives sight time = 0608 ZT; the latter gives 1808ZT. Under some circumstances we might be able to judge from this much information alone, but not in this case— either one could be within twilight without further knowledge. So we need to check which one of these happens to be in twilight when stars and horizon can both be seen. Checking the 1981 Nautical Almanac, and noting that DR-Lon 53º 3.9’ = 3h 32m (Arc to Time table), we find that sight time in the morning (ie nautical to civil twilight) = 0646 to 0812 LMT, which corresponds to 1018 to 1144 UTC. We find the LMTs in the Almanac, and then correct for the longitude to get the UTC, ie 0646 LMT + 0332 (Lon correction) = 0978 = 1018 UTC. Evening sights are taken between civil and nautical twilight, which in this case would be 1630 to 1715 LMT, which corresponds to 2002 to 2047 UTC. We see that an AM CT is very close to morning twilight time, but the PM CT is not close at all. Thus we know then that the CT given must have been AM, and that the UTC we need for the problem is 10h 08m 18s - (2m 12s) = 10h 06m 06s. On 30 March in DR position LAT 20°26.2’N, LONG 131°17.9’E, you take an ex-meridian observation of the Moon’s lower limb at upper transit. The chronometer time of the sight is 10h 36m 02s, and the chronometer error is 02m 06s slow. This one is a more challenging CT puzzle, meaning we simply have to know they ask such questions and be prepared with how to solve them. There are no zone times given for anything, which always makes the solution more interesting. We can assume ZD is -9 (from 131º/15 = 8.7, which rounds to -9. So we ask (after applying CE) does UTC = 10 38 08 or UTC = 22 38 08? Checking to see what the ZT of the sight would have been for each of these interpretations, we have to choose between: 1938 ZT Mar 30 or 0737 ZT on Mar 31? But since this is a moon sight, we cannot get any hints from the twilight times—moon sights could occur in either twilight or throughout the day. So they are handing us a bit more than the average amount of sleuth work. Unlike the sun, when we know mer pass is near midday on ZT, we have no such hint about when the moon might cross the meridian. At this point, we might resort to a nuance mentioned in an earlier example, namely the statement that your sight is from a DR position on a given date essentially implies the ZT date of the sight time is the one given. There is no zone time given, just the CT, and the CT is UTC (either AM or PM), but without other information, we have to assume the UTC date is the one given. In other words, this is either 1038 UTC on Mar 30 or it is 2238 on Mar 30. These two different interpretations of the CT would in fact lead to different days on the ZT clock, which could be all we need to know to choose the right UTC. In other words, from the DR date argument alone we would have to choose the PM interpretation of CT leading to UTC = 22 38 08 Mar 30. But these arguments about the DR and CT dates are just what we have discerned from looking at a lot of USCG problems. That interpretation of the dates is not spelled out in any official definition. It would be reassuring to have some physical evidence to back this up—navigators do not like to rely on just one source of information for crucial decisions. So we should look into this a bit further. It is an upper transit, so that means the GHA of the moon must be near the DR-Lon at the sight time. The Lon of 131º E corresponds to a GHA of (360 -131) = 229º. So we can look up the GHA at 1038 UTC on Mar 30 and at 2238 UTC on Mar 30 to see which one puts the moon on or near the meridian, ie has a GHA of about this value. At 1038z the moon is no where near the meridian (actually not even above the horizon), so the CT was clearly set to PM, and we have the correct UTC = 10h 38m 08s. To save time, you could learn this faster by just checking the GHA at the whole hours in the Almanac (1000 and 2200) since one is not even close. Looking ahead, with a GHA of 220W and a Lon of “229W” (ie 131 E), when we finish this problem, we should expect the moon to be to the left of the meridian. Its GP (moving west around the globe) has another 9º to go before it gets to the DR meridian. A meridian is a longitude line. Your meridian is the longitude you are on. Meridian transit—also called meridian passage (mer pass)—is the time a celestial body crosses your meridian. The sextant height of the body above the horizon at that moment provides your latitude with a just a few steps of paperwork, and thus this has been a popular exercise in cel nav since earliest days. When it is the sun crossing your meridian, it is called Local Apparent Noon (LAN), with the sun at its peak height in the sky, bearing either due south or due north. Latitude from LAN is part of every text on cel nav since the mid 1700s, but it has clung to prominence in modern times far beyond its practical value. We tend to think most often of stars and other bodies moving east to west across the sky. The motion is left to right looking south, or right to left looking north. These paths are called the upper transit of a body across the horizon, because in both cases the bodies are moving over the top of their nearest poles. Upper transits reach their highest angle above the horizon as they cross the meridian bearing due north or south. But if we look toward the elevated pole in either hemisphere, we also see circumpolar bodies moving the other direction, west to east, as they pass under their nearest pole. These bodies, in contrast, reach their lowest elevation as they cross the meridian. These are called lower transits. We can find our latitude from either transit. 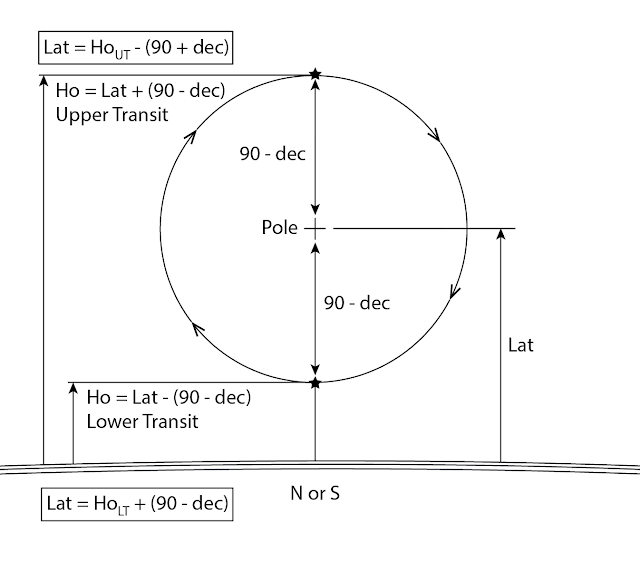 To get an accurate latitude this way we need to measure the peak sextant height (upper transit) or minimum sextant height (lower transit), which defines the transit. This is usually accomplished by estimating the time of the transit from our DR position and the Nautical Almanac—a process that takes just minutes—and then we start the sights somewhat before that time, and take a series of sights until we see that the maximum or minimum has indeed been captured. It can happen, however, that our best plans don’t work out. Just as we approach the peak height in a noon sight, the sun might get covered by clouds. We end up with a sight near the transit, but not exactly at the transit. Likewise we might notice at twilight that we have time to take a lower transit star or planet near the meridian, but discover that it is already going back up. We missed the lowest point at the true transit. Or we might catch one going down, but it gets too light out to see it start back up. Again, we have a sight near the meridian transit, but not right at the transit. A near miss on the transit, however, does not have to be a miss on a latitude determination. The paths of the bodies are well predicted, so if we have accurate time and a reasonable DR accuracy we can figure out what the height of the body would have been had we actually seen it cross the meridian, and from this we can figure a latitude in the normal meridian transit method. This type of near miss sight solved for latitude is called an ex-meridian sight. If it were not for the USCG tests, and like-minded thinking elsewhere, these methods would have disappeared 50 years ago. I like to think of this as the way the USCG supports navigation schools, so we remain grateful to them. The reason these particular cel nav questions should have disappeared is they are not needed—meaning they do not add to the navigation—and they risk presenting a false sense of accuracy in latitude. The sextant sight alone (regardless of what time it was taken) provides a line of position (LOP) on the chart that we know we are on. If the time happened to be at mer pass, the LOP is parallel to the bottom of the chart (i.e. it is a latitude line), but if the sight is a bit earlier or later, the line is tilted some degrees, depending on how far the time was from mer pass, as shown in Figure 1. The navigation information is no different. We are somewhere on the line. The ex-meridian sights originated at a time when it was not easy to do what we now called a sight reduction to find an LOP—in fact, the methodology had not yet been discovered at the time, so this was a way to get something from a sight that would not otherwise be useful. This has long not been the case, so these should be thrown out. Figure 1. LOPs near meridian passage. Each LOP is perpendicular to the azimuth line pointed to the GP of the sun. Indeed, the prominence of even the simple meridian transit sights—forgetting about ex-meridians—is likewise overrated, for exactly the same reason. Meridian sights take much longer than regular sights, because we need a longer sequence of sights to identify the peak or minimum value, and these sights must be done at a specific time of day. In contrast, we do just as good navigation taking the sights whenever we need them in the most efficient manner. The popularity of taking the noon sight is largely tradition; we could just as well find our position at a comfortable time near midday, then DR to the time of LAN we did (or will) experience, and record that LAN position in the logbook for the sake of tradition. 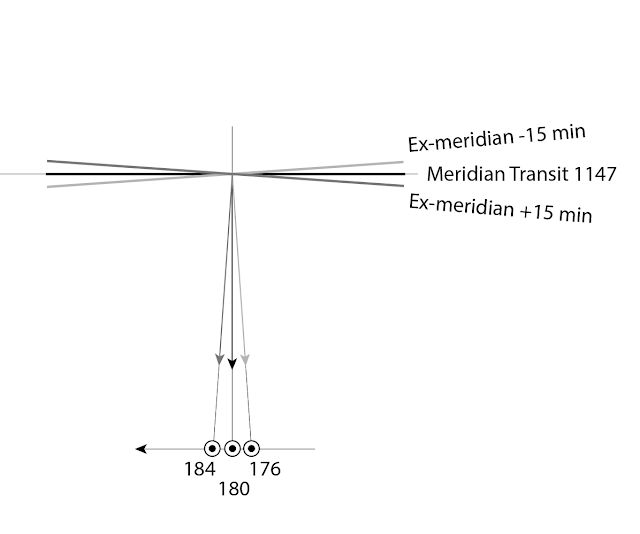 At this point we show a few graphics to illustrate meridian and ex-meridian sights, then jump straight into shop talk (ie we are going to assume the reader is familiar with standard sight reduction) to show a trick way to solve ex-meridians that is faster and less prone to error than the conventional solution using Bowditch Tables 24 and 25. The key concept is the zenith distance, z = 90º - Ho, is equal to the distance on the globe between the observer’s position (Lat, Lon) and the geographical position (GP) of the body. As a body circles the earth, z decreases as it gets closer, while its height in the sky (Ho) increases, as shown in Figure 2. At mer pass, z is minimum and Ho is maximum for an upper transit. If the GP is close enough to us (meaning for practical purposes, Lat and Dec are not more than about 80º apart) then we see the body in the sky throughout its path around the earth. Viewed in the sky, it is called circumpolar. For these bodies seen crossing our meridian on the other side of the earth, the situation is reversed—at lower transit, z is maximum, and Ho is minimum. Celestial Navigation: A Complete Home Study Course. 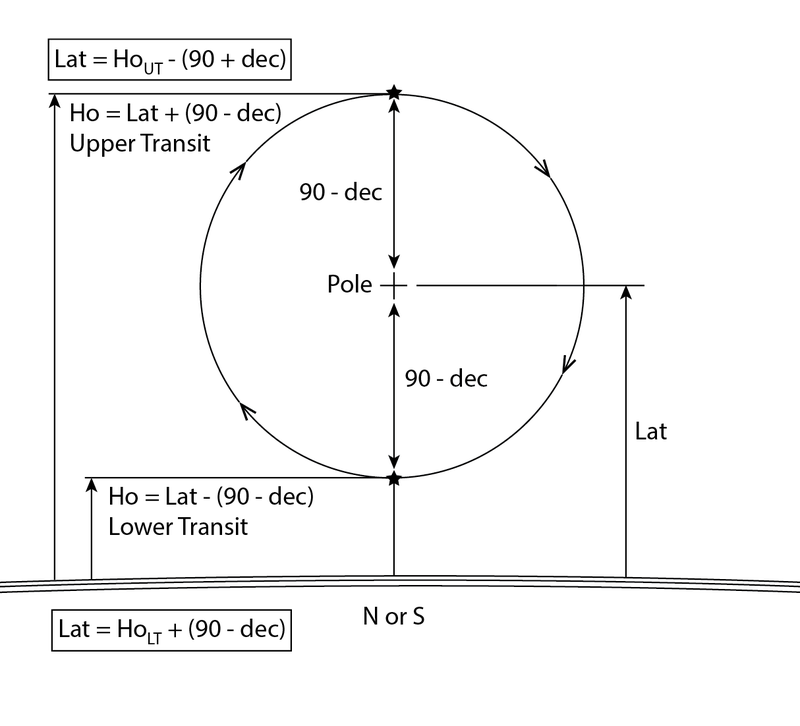 A lower transit sight must be of a circumpolar body, which means Lat and Dec are Same Name and the Dec > (90-Lat). Figure 3 below shows the simple way we can determine Lat from a true meridian transit. Figure 3. 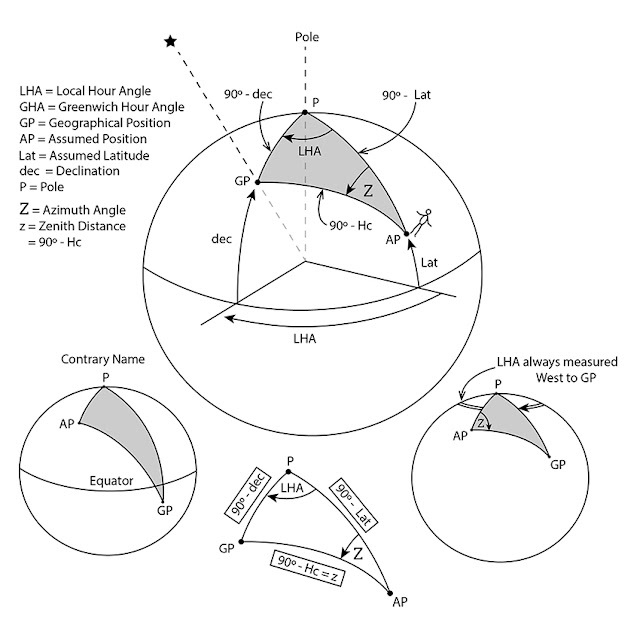 Computing Lat from meridian sights of circumpolar stars. Only addition and subtraction of Ho and the Dec is needed for upper or lower transits. The height of the elevated pole is always equal to our latitude. To be circumpolar, a star must be Same Name with Dec > (90 - Lat). 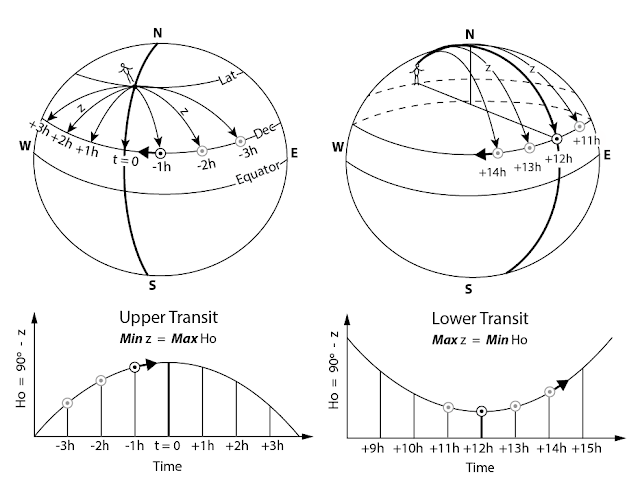 When we miss the true transit, we have the situation shown in Figure 4. Figure 4. Body heights at upper and lower transits and the height differences between them. The correction is not precisely the same for upper and lower transits even if they miss the meridian by the same time difference, because the peak height of the path affects its shape, but for either one, the correction is the same on each side of the transit at the same time offset. Since the problems can involve any latitude looking either direction, we recommend plotting a sketch of the LOP before choosing an answer. 253. (5.1.2.1D-11) On 15 August  an ex-meridian altitude of the Sun’s lower limb at upper transit was observed at 1130 ZT. Your DR position is LAT 26°24.0’S, LONG 155°02.0’E, and your sextant altitude (Hs) is 48° 45.9’. The index error is 2.6’ on the arc, and your height of eye is 51.5 feet. The chronometer time of the observation is 01h 27m 38s, and the chronometer error is 02m 14s slow. 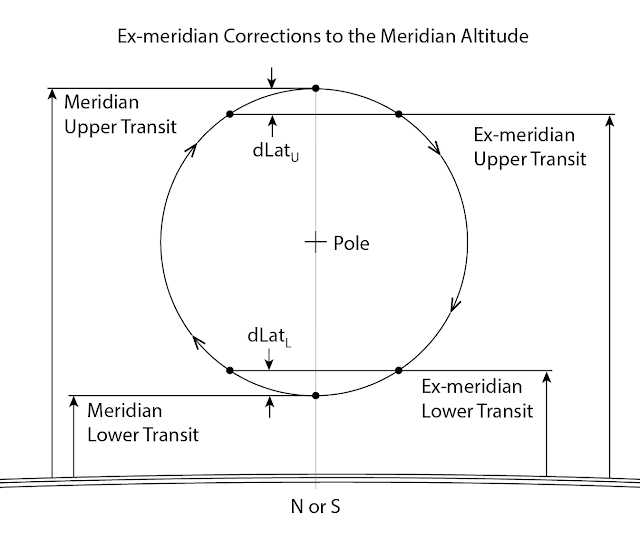 Find the latitude at meridian transit from the ex-meridian observation. From Nautical Almanac, converted to decimals for later computations. Step 2. Do a sight reduction by computation from the DR position, just as if we were going to do normal navigation and plot an LOP… which we are in fact going to do. We can use computation here (as opposed to Pub 229) because to be prepared for the full range of USCG great circle sailings questions we must know the same formula. Sign Rules: enter all angles as positive, but if contrary name, enter Dec as a negative number… which is the case at hand. Now find the azimuth angle Z. Step 4. Make a sketch of the LOP plot to figure the ex-meridian Lat, i.e. to find what our latitude would be if we assume the DR-Lon is correct, which is part of the rash assumptions made in all ex-meridian sights. We could plot this and read it from the scales, but for ex-meridian only we can compute the offset; the sketch just keeps the situation in perspective, ie does the correction make our ex-meridian Lat larger or smaller than the DR-Lat, as shown in Figure 5. Figure 5. A plot sketch to check the computation of dLat. The scale does not matter, we just want to show that for S Lat with Zn to the N, an a-value Away makes the Lat a larger number to the south. 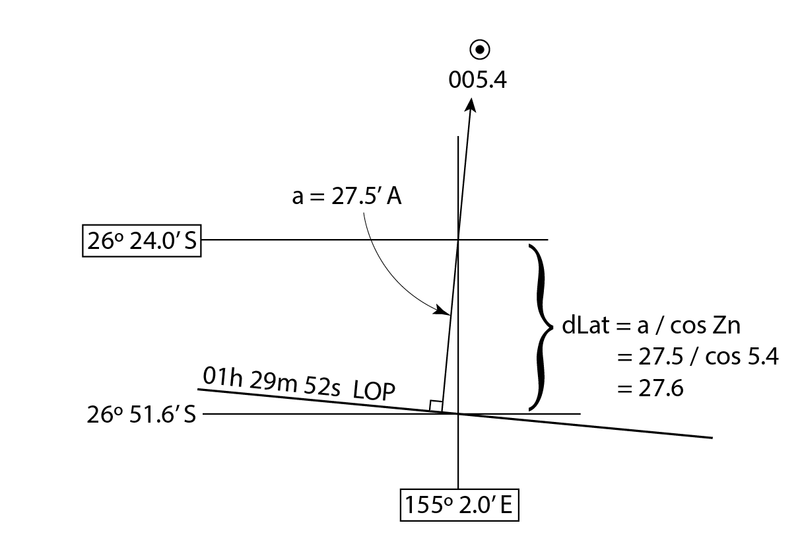 Note that in this fictitious problem made up by the USCG for the exam, we find a latitude that is near 30' off the DR-Lat with a method that must assume the corresponding DR-Lon is correct. We know the LOP is correct, and we should in practice just leave it at that. The offset can be computed from dLat = a / cos Zn, which means the ex-meridian Lat = DR-Lat + dLat . In this example, dLat = 27.5 / cos 5.4 = 27.6’ and the final answer is 26º 24.0’ + 27.6’ = 26º 51.6’ S, which is answer B. 164. (5.1.2.1C-1) On 16 June  in DR position LAT 50°57.0’S, LONG 53°03.9’W (ZD+4), you take an ex-meridian observation of Acrux at lower transit. The chronometer time of the sight is 10h 08m 18s, and the chronometer error is 02m 12s fast. The sextant altitude (hs) is 23°49.0’. The index error is 1.1’ off the arc, and your height of eye is 26 feet. What is the latitude at meridian transit? In contrast to the first example, the ZT of the sight was not given, but with ZD = +4h we can check CT. That is, CT = 1008, means either UTC = 1008 or 2208. The first gives sight time = 0608 ZT; the latter gives 1808ZT. Under some circumstances we might be able to judge from this alone, but not in this case, ie either one could be twilight without further knowledge. So we need to check which one of these happens to be in twilight when stars and horizon can both be seen. Checking the 1981 Nautical Almanac, and noting that DR-Lon 53º 3.9’ = 3h 32m (Arc to Time table), we find that sight time in the morning (ie nautical to civil twilight) = 0646 to 0812 LMT = 1018 to 1144 UTC, and in the evening, 1630 to 1715 LMT = 2002 to 2047 UTC. So CT 1008 is a morning sight corresponding to 1008 UTC. UTC = 10h 08m 18s -02m 12s = 10h 06m 06s. Look up Nautical Almanac data and convert to decimals. [Acrux is a bright star at the base of the Southern Cross, and now we know that at sight time it was 176.6º west of us. This is confusing information as we know we were looking south and would expect—from upper transit experience—a Zn within a few degrees of 180, which for upper transits would in turn call for LHA of a few degrees or (360 minus a few degrees). Step 2. Do a sight reduction from the DR position. Step 4. We could make the sketch, but at Zn = 181.6 the angle off the meridian is just 1.6º, which will not change the a-value, so dLat = a-value. We are S Lat looking S, so an Away a-value makes the Lat a smaller number. The offset can be computed from dLat = a / cos Zn, which means the ex-meridian Lat = DR-Lat + dLat . In this example, dLat = 15.8 / cos 181.6 = -15.8’ and the final answer is 50° 57.0’ - 15.8’ = 50º 41.2’ S, which is answer A. Final note: We have used a shortcut method to find a logical value of the Lat, namely if your DR Lon is right, then this is the right Lat. But this is not the Lat at meridian transit. It is the Lat at the time of the sight. 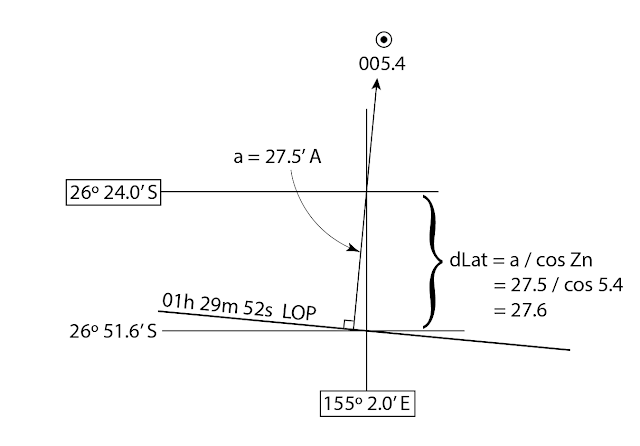 These USCG exam questions inevitably ask for the "Latitude at meridian transit," and then proceed to find the result using two tables in Bowditch, which are specifically annotated as "...remember that the value obtained [using Tables 24 and 25] is the latitude at the time of observation, not at the time of meridian transit." And since course and speed are never given with these problems, this is all we can do. So I maintain that these problems, along with the ones they have for finding compass error by amplitude, should be removed from the tests. The latter should be removed for the same generic reason, namely there is an easier and more accurate way to get the result... maybe not 80 years ago (before sight reduction tables) but certainly today. The sight reduction method we use in celestial navigation is based on this triangle drawn on the earth's surface. You do not, however, need to know anything at all about this triangle to do celestial navigation and do it well. It comes into play when we wish to understand more about the fundamentals. It is also valuable to know for USCG cel nav exams as it can save much time on some problems, and it is essentially required to solve selected great circle sailings problems—ie, in principle you could use Pub 229 for these, but the test room only has vol 2, whereas some of the sailings questions start off in vol 1. The navigation triangle. Image from Celestial Navigation: A Complete Home Study Course, Second Edition. The corners of the triangle are the north or south pole (P), the assumed position (AP), and the geographical position (GP). AP-GP = (90° - Hc), which is the zenith distance. The side we care about is the zenith distance (z) which is the length of the line from AP to GP. (1) All angles are treated as positive, regardless of hemisphere, except for Contrary Name, make Declination a negative angle, regardless of hemisphere. Cos(Z) = [Sin(dec) - Sin(Lat) x Sin(Hc)] / [Cos(Lat) x Cos(Hc)]. (2) If the final Z is negative, then Z = Z + 180, regardless of hemisphere. The formula is for Z (azimuth angle) and not Zn (azimuth). The normal rules for converting Z to Zn based on LHA and Lat apply. Note also, we have two Z's. Upper case Z = azimuth angle; lower case z = zenith distance. This is traditional, so we do not change it. Above notes and graphics adapted from Celestial Navigation: A Complete Home Study Course, Second Edition. First pass at cell phone barometer calibration. Most modern cell phones have a barometer in them that could be a valuable aid to your navigation. They tend to draw extra power if we try to record pressure history with them, but we can always turn them on, read the pressure and write it in the log book, and turn it off—ie, the way mariners have recorded pressure history for several hundred years. The only difference now is these phone barometers are generally pretty accurate, whereas many barometers on boats are not very accurate. As noted below, we have easy and free ways to check their calibration online and we should do so. But even without that, chances are, right out of the box they could still be the most accurate barometer on the boat. More than adequate apps are free; in fact the more complex expensive ones are not as functional in many cases. If you have not done so, it will pay to download a free one and play with it. So it was inevitable that we start a study of their accuracy and indeed we report here a first step in that direction... thanks in large part to Erik Kristen who brought a few over to the office this afternoon to test. Below are the results for a Galaxy S5, iPhone 6+, and a Samsung Note 2. The actual pressures displayed were at best accurate to within in 0.8 mb and the worse to within 2.2 mb. But the bigger question is are these off by the same amount at all pressures we might run into, and the answer is yes, that seems to be the case in the ones we tested, which is not really a surprise. In short, they are pretty good. They were each linear over the range covered: best at ± 0.1 and the worst ± 0.2, though we should not conclude anything from this first study on relative models. The S5 would not work below 950 mb, but that was likely an issue with the particular app we were using and not the phone barometer. A different app would most likely go to lower pressures. The best app is the simplest one. We just need the sensor pressure and a way to offset it. Many apps include confusing ways to set the pressure to local airport values, or they use GPS elevation, or smarter ones could use the National Elevation data set based on Lat-Lon, but in any case these schemes do not work. The errors in these corrections are larger than the inherent sensor error. We want just plain station pressure read from the sensor, and we have to know it is not sea level pressure till we are on the boat. The best iPhone app I have found is called "hPa," which is the abbreviation for hecto Pascal, a pressure unit the same as a millibar. Maybe the real name is "barometer." It is in the iPhone App Store. More news on this as we learn more, but the first pass at testing them looks very promising. You can always use the free resource at www.starpath.com/barometers to set your phone to the right pressure. We have a link to phones with barometers in the list of resources at www.starpath.com/cyc, but you have to do a bit of research on older phones. For example, the baro phone link lists Moto X (Gen 2, 2014) as having a barometer, and indeed many of the original spec sheets listed one, but it seems this phone does not have a barometer in it... at least one that can be accessed by any 3rd party apps, which are required to read the pressure.